For Many years, the "Haunted Deck" effect has been favored and loved by all magicians. The old methods to create this fantastic effect were fiddly and sometimes tricky to perform easily. As of late, brand new versions of it have been released like "Really Haunted" and "Spirit" from Alakazam. All, of course used a gimmick that would have to be carried with you. But what if? What if you had the effect on you all the time as long as you carried a deck of cards? What if there was no gimmick in your deck to begin with? What if you brought S.C-A.R-E.D by Jamie Daws? Effect: You tell the story of when you and your friends were young, up on a hill was an old haunted house. However, this never S.C-A.R-E.D you because you had a haunted deck. 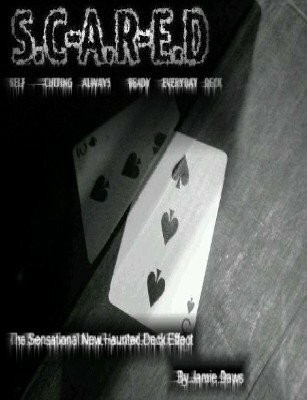 The haunted deck would help you when you went Trick or Treating at Halloween. The haunted deck would tell you which house had the most candy. You use the deck to reveal a thought of card that you could have never known. The only way to have known it, was the spirits in the deck. You remove the card from your deck and explain that sometimes your deck would move on it's own. You place the card inside the deck and place the deck on the table. you rest your hand to the side of the deck and the deck mysteriously begins to cut itself! The card that the deck cut at is removed and it is in fact the selected card! Incredible! No Glue, Tape or Scissors! Nothing Added or Taken From the Deck! Start Completely Clean with NO Gimmicks in your deck! This effect is quite easy to do and it is an absolute stunner. You can put all your efforts into presentation. I bought this pdf shortly after seeing the very positive review in the 8/12 Linking Ring of the DVD version of the same effect. Perhaps you can learn more handlings from the DVD (it appears to have a few extra ways of using the basic ideas) but this manuscript is crystal clear. For less than 1/4 of the price of the DVD, you can be doing SCARED in a few hours. Wow! Just got this and started playing around with the method - it looks great! The movement is completely under your control and the angles are excellent. For $8.00 this is a bargain. Easy to prep and no threads to play around with so lighting is not an issue Two methods are given as well as different presentations submitted by other users. 24 pages of well written and easy to follow instructions. So practical! I absoloutely love it! Simple, effective, clever and it fools me every time I perform it to myself! Great :)!